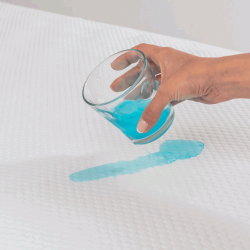 Poly quilted pillow protector laminated with Waterproof and breathable polyurethane membrane. Springy quilting effect for greater comfort. Allows for optimal air circulation and provides heat insulation. Barrier against dust mites, bacteria and fungi. Samples and a brochure are available, to receive these please call 01706 220020 or contact us and send us your details. Round Quilted Mattress ProtectorPoly quilted mattress protector laminated with Waterproof / Bre..